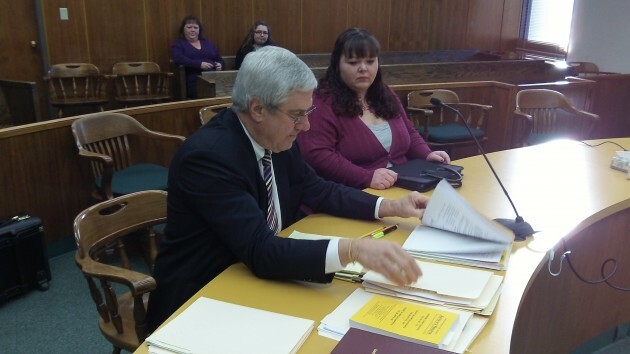 Mandy Kenney with Kent Hickam, who successfully defended her. Her mother and niece are in the back row. It took a while, but Mandy Kenney finally got her day in court on Wednesday, and Linn County Circuit Judge Carol Bispham found her not guilty of two misdemeanors, driving under the influence of intoxicants and reckless driving. Kenney, 29, is a mother of three who lives with her parents at a Turner address in Marion County. After midnight on Feb. 2, 2012, she found herself sitting on the gravel shoulder of Richardson Gap Road in Linn County next to her brother’s car, which was in the ditch. She told deputies she didn’t know how she got there but had taken Ambien, a sleeping pill, the night before. Tests showed no alcohol or other drugs in Kenney’s system, just Ambien and a prescription anti-depressant. Wednesday’s one-day trial established that sleep-driving is a recognized side effect of Ambien. When deputies found her, she was wearing pajamas and her 16-year-old niece’s shoes, about two sizes too small for her. Prosecutor Michael Wynhausen argued that she was impaired by the act of taking Ambien, her driving clearly had ended in a crash and that’s all he needed to show. Defense lawyer Kent Hickam bore down on an Oregon Supreme Court decision last May, in the case of a Portland man named Newman. In that case the court said that under Oregon law, defendants must have committed a “voluntary act” in order to be convicted of a crime. This, Judge Bispham found, the state had failed to prove. No one, she said, takes a sleeping pill and expects to be convicted of a crime. Tiffani Yeager, on Facebook: I happen to know that Mandy is an amazing person, and even better mother. The fact that this happened to her was enough of a nightmare …. I’m proud of you, Mandy, for staying so strong threw all of this! Christine Ruck, on Facebook: Absolutely NUTS. Every driver behind the wheel is responsible for their actions. What if she had injured someone?